Indian long dress in cotton with design, smocked top of the back, made in India. Pretty Indian cotton long dress printed with multicolored round, back smocked, string under the chest, made in India. Indian sleeveless dress in cotton and embroidery, size 6 US, white and blue. Pretty short sleeveless dress made of Parachute fabric, light, comfortable and original.Zip closure in the back, 1 central pocket and 1 on each side closing by a small Velcro strip. 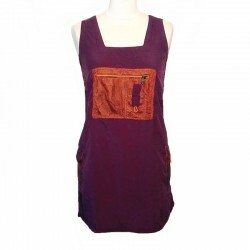 Indian short cotton dress, smocked top of the back, made in India. Indian sleeveless dress in cotton and embroidery, orange and blue-green, flared dress in a beautiful style. Short cotton dress with colorful rosettes, elasticated on the back, 1 pocket on each side, made in India. Pretty short adjustable strapless dress made of Parachute fabric, light, comfortable and original.Zip closure in the back, 1 central pocket and 1 on each side closing by zip.